More than 12,000 state retirees receive annual pensions of over $100,000 for lifetime payouts that average $3 million. 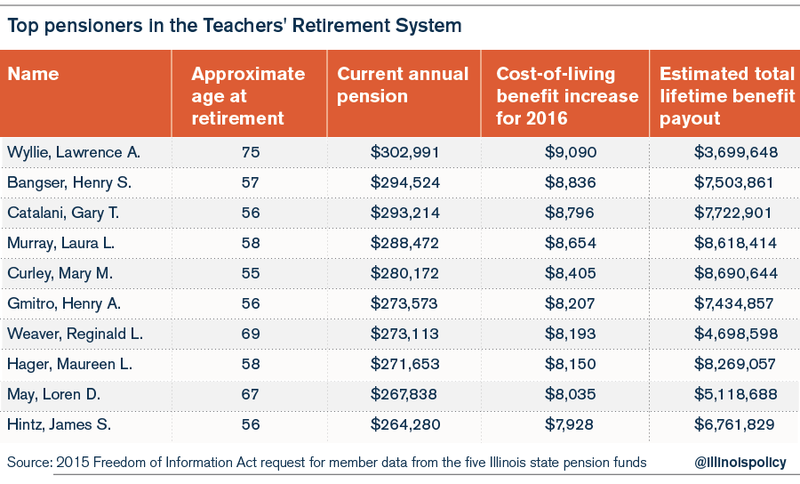 In Illinois’ five state government-worker pension funds – covering teachers, university employees, state workers, judges and politicians – more than 12,000 state retirees receive annual pensions of over $100,000. This group of retirees will receive an average of $3 million in lifetime pension benefits – far more than any private-sector worker receives from Social Security. One of the reasons lifetime payouts are so high is that pensioners begin drawing benefits in their 50s, far earlier than workers in the private sector do. 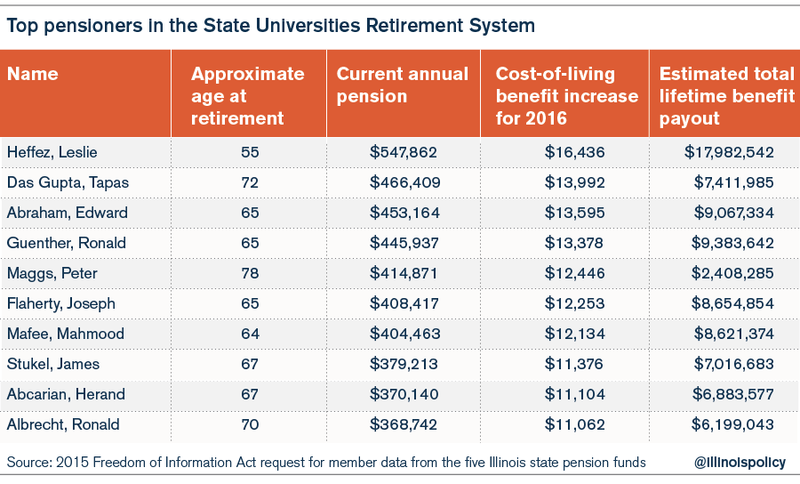 Among those retirees is the state’s top pensioner, Leslie Heffez, a retiree of the State Universities Retirement System, or SURS, who can expect to receive nearly $18 million in benefits over his lifetime (assuming a current life expectancy of 81 years). In 2015 alone, Heffez received $547,000 in pension benefits. By contrast, the maximum annual benefit a private-sector retiree who retires at age 67 can receive from Social Security is $32,000. As part of his annual compensation, Heffez also received an automatic 3 percent cost-of-living adjustment, or COLA, increase of over $16,400, which is more than the average annual Social Security payout. That means Heffez’s annual pension increase was as large as an average retired American’s annual payment from Social Security. And since COLA benefits are not means-tested, Heffez will continue to receive COLA increases annually – which contribute to his expected $18 million in lifetime pension benefits. 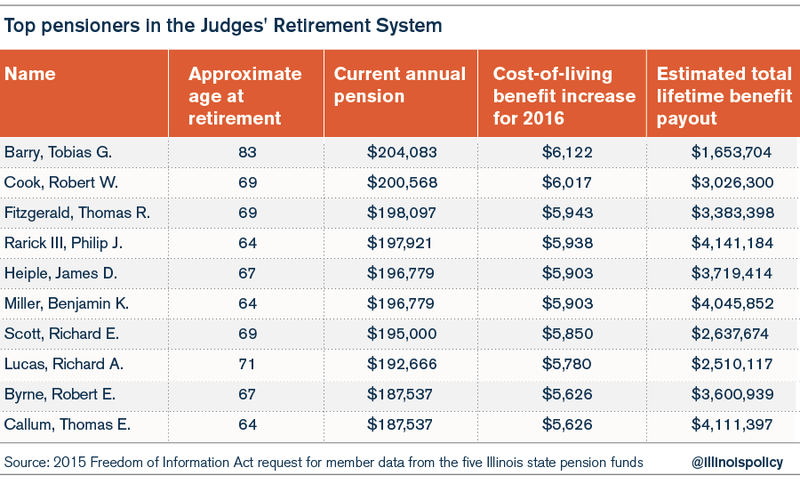 While Leslie Heffez and the other top 10 pensioners are far and away the most highly compensated public-sector retirees in Illinois, most other pensioners in the state’s government-worker pension systems will receive million-dollar lifetime payouts as well. 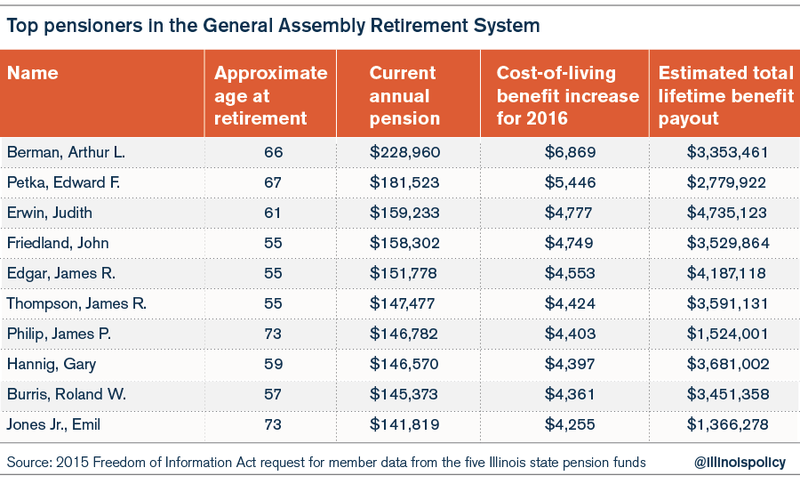 In all, 53 percent of the over 213,000 state retirees in Illinois can expect to receive lifetime pension benefits of more than $1 million. Almost 40,000 (18 percent of all retirees) will receive $2 million or more in benefits. By contrast, private-sector workers with average Social Security benefits will only receive approximately $400,000 in lifetime benefits. To be clear, government workers who receive such generous benefits have done nothing wrong – their benefits are what their unions successfully negotiated with Illinois politicians. However, it’s also clear that a system that creates so many millionaire pensioners imposes an unfair and unaffordable burden on the average Illinois taxpayer. 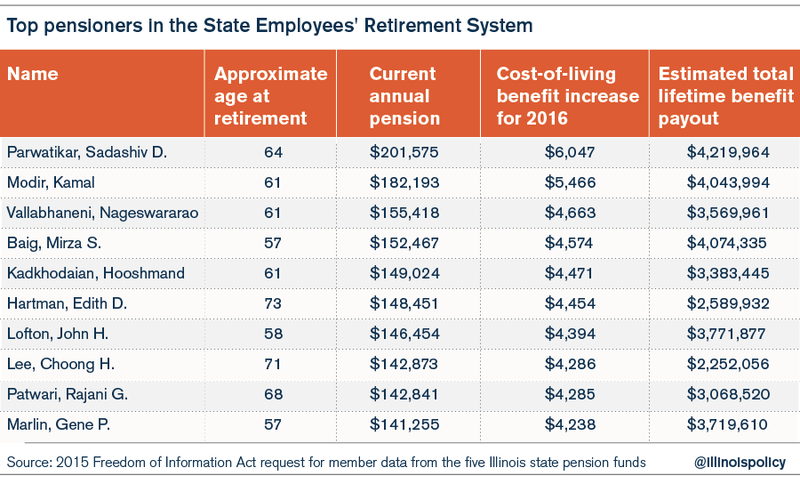 Illinois needs to end such benefits going forward – starting by moving new government workers onto 401(k)-style plans. Doing that, in addition to other key reforms, is an important first step toward fixing Illinois’ government-worker pensions.